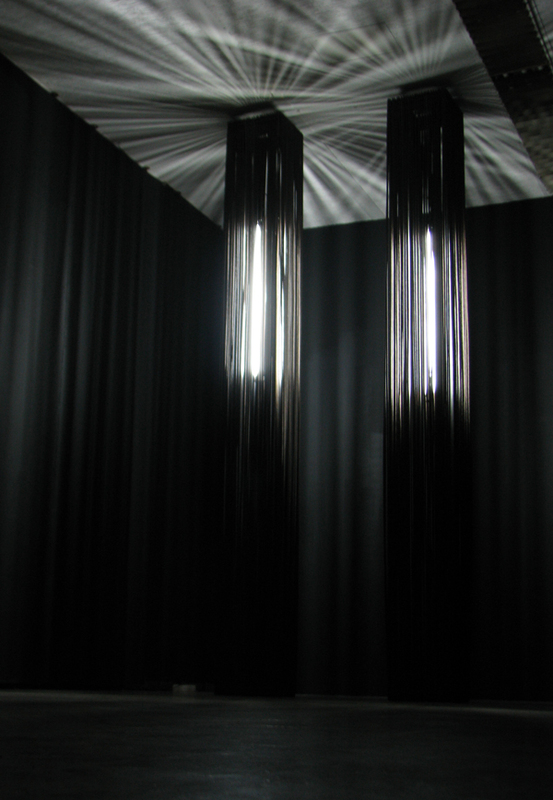 The installation is constructed of two monoliths, vertical raster’s that captivate light enshrined within. It, the light, attempts to annihilate the imposed boundaries by breaking outside the limited space. The contrast between dark cables and the light creates an illusion of captured universal being. It penetrates a new, outer space, continuing its movements and existence despite the imposed limitations. The cells (Monoliths) have a double function: to limit and to edit. The light alludes to an exit, and while being dispersed throughout the space it generates numerous rays that, in turn, create vertical shadows (Codes). The light is Being's performance; in different cultures it symbolizes enlightenment, it is the sustainer of life, main force in the universe that everything begins and ends with. The lightness and darkness, day and night signify binary oppositions and alternate virtues. The inherence of these elements corresponds to Yin/Yang, where Yin contains a trace of Yang and vice versa, creating a balance in the universe. The light spreads across objects and material world, radiates rays of hope. Its qualities do not only imply survival, but process of living. It embodies the universal consciousness, faith and hope. The light glows outside a cold and limited materiality. Our human experiences are reflected in its peculiar surface, exposing the numerous attributes of the contemporary world: totalitarian politics, institutions, technological networks, economy and surveillance. The work reflects a location where is presented and consequentially corresponds to different narratives. Simultaneously, it always retains a familiar experience of the original location (Sarajevo). This fact enhances the unique qualities of the sculpture: the inside prisoner is deprived from both light and freedom. The work addresses universal, human experiences and implies transformations of our consciousness.